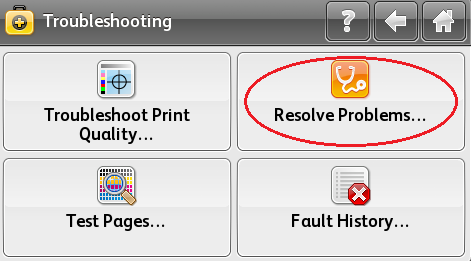 Select [Printer] on the Touch Screen. Select [Colors Look Wrong]. A "Are colors off, or look drastically wrong?" message will be displayed. Select [Calibrate Color]. 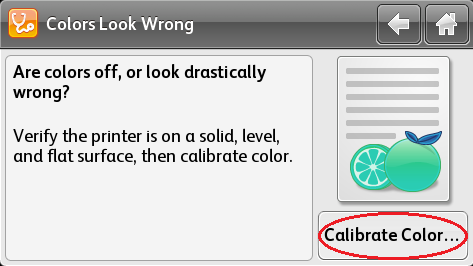 The Color Calibration page will be printed. 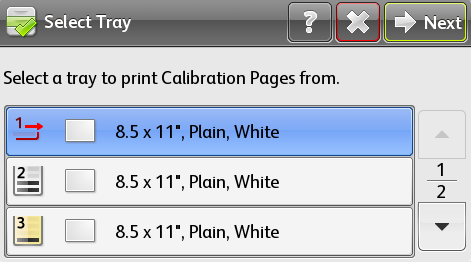 Select a paper tray to print the Calibration Pages from, and then select [Next]. 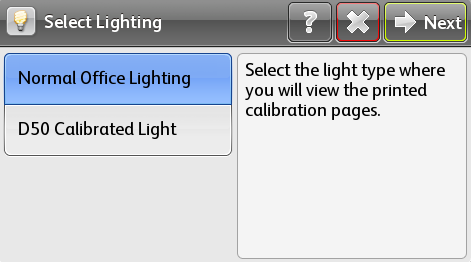 Select the light type where you will view the printed Calibration Pages, and then select [Next] to print the Calibration Pages. If Gray Balance Only was selected in step 7, skip to step 17; otherwise, continue with the next step. 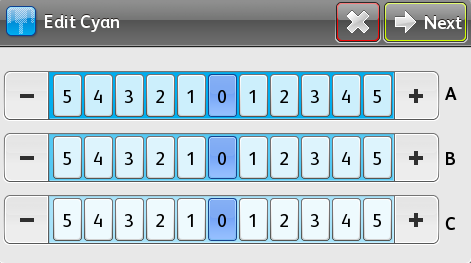 Modify Cyan, as required, and then select [Next]. 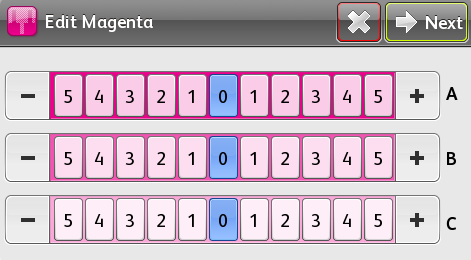 Modify Magenta, as required, and then select [Next]. 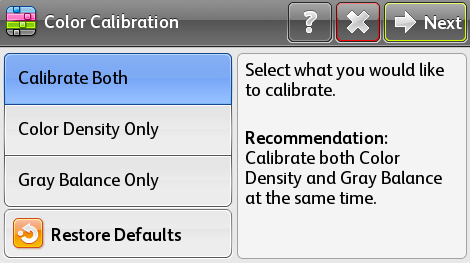 Calibration Pages will be printed. 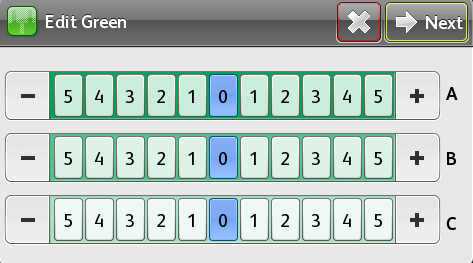 Modify Green as required, and then select [Next]. Modify Black, as required, and then select [Next]. 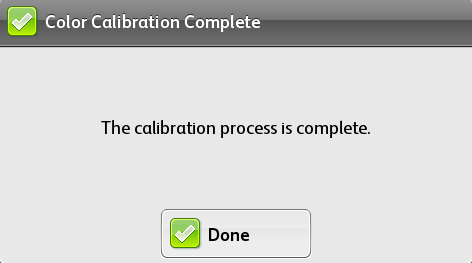 Calibration Pages will be printed. If Color Density Only was selected in step 7, skip to step 23; otherwise, continue with the next step. 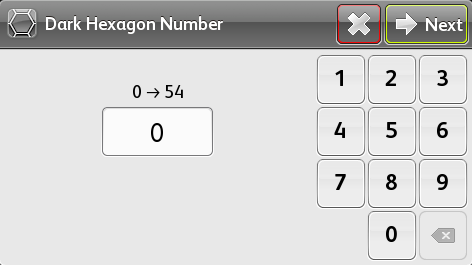 Enter a number between 0 - 54 in the Light Hexagon Number field, and then select [Next]. 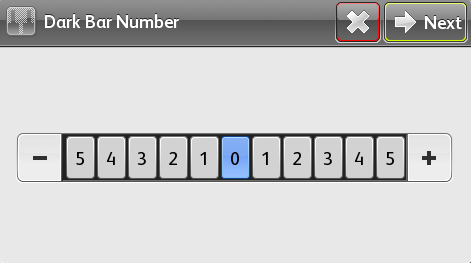 Select a number between -5 and +5 in the Light Bar Number field, and then select [Next]. 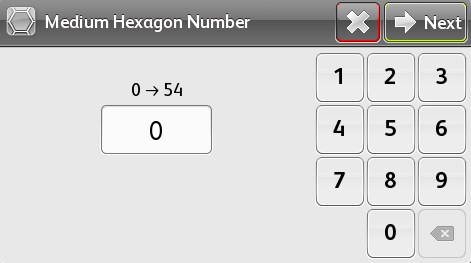 Enter a number between 0 - 54 in the Medium Hexagon Number field, and then select [Next]. 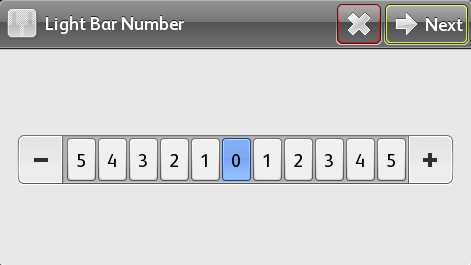 Select a number between -5 and +5 in the Medium Bar Number field, and then select [Next]. 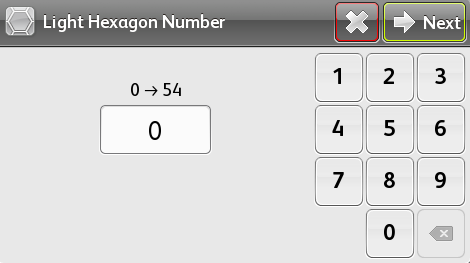 Enter a number between 0 - 54 in the Dark Hexagon Number field, and then select [Next]. 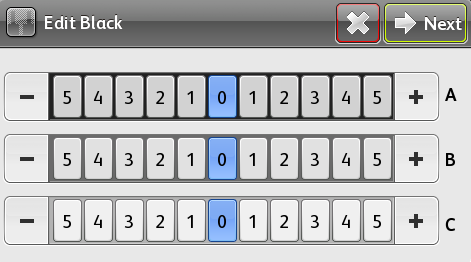 Select a number between -5 and +5 in the Dark Bar Number field, and then select [Next]. 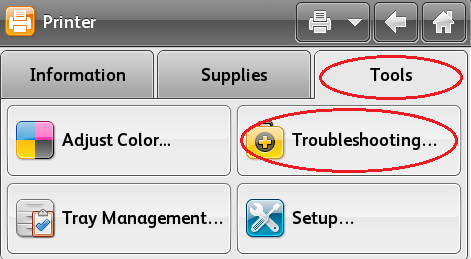 When the Color Calibration Complete window is displayed, select [Done].